receives approval from an HREC or endorsement from a specialist college. The TGA will assess the application and make a decision. If you are a medical practitioner wanting to apply to TGA for Authorised Prescriber status, your application will need to be approved by a Human Research Ethics Committee (HREC) or endorsed by a specialist college. access to the facilities needed to appropriately administer and monitor treatment. The application should contain evidence of the unapproved good's suitability for the intended indication that supports the clinical justification the medical practitioner has provided. The application will include the following details of the unapproved good. 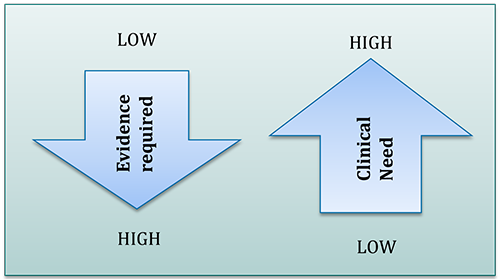 The global regulatory status of the unapproved good may affect the level of evidence required in the application. This table describes differences in global regulatory status and the effect that status may have on the level of evidence required. This information in Figure 3 is provided as a guide only. You may wish to contact the HREC or specialist college before you submit your application to ensure you submit the necessary evidence. TGA encourages the use of approved therapeutic goods as these have been assessed for safety, quality and efficacy. The clinical justification for use of the unapproved good should provide sufficient evidence to demonstrate that this use is appropriate, considering the availability of any approved goods that may be suitable alternatives. will they be attempted prior to supplying the unapproved good? The use of unapproved goods is considered experimental. The Authorised Prescriber must obtain the informed consent of each patient for whom they prescribe the unapproved good. It is best practice to obtain informed consent in writing using a standard form. The medical practitioner will provide the template of the informed consent form they intend to use with their application to the HREC or specialist college. This should not be submitted to the TGA, but should be kept on the patients file. If the unapproved good is, however, derived from biological tissues including blood or plasma, the medical practitioner must obtain informed consent using the form available on the TGA website. It will also state the period for which the approval will be valid. All approvals are subject to general conditions. TGA may also apply specific conditions on a case-by-case basis. You must meet these conditions to retain your approval. The approving HREC or endorsing specialist college may also apply conditions to your approval. Once you have been authorised to be an Authorised Prescriber of an unapproved good, you may prescribe that good to patients in your care. You should inform the HREC or specialist college which approved or endorsed your application of our response and provide them with a copy of the decision letter. If we do not authorise your application to become an Authorised Prescriber, you may submit a new application addressing the reasons for rejection. If you wish to appeal a TGA decision, and before you make a formal appeal, you should contact the delegate who evaluated your submission to discuss the matter informally. You must have attempted to appeal a decision under section 60 of the Therapeutic Goods Act 1989 before lodging an appeal with the AAT. As an Authorised Prescriber, you are responsible for obtaining the unapproved good. You can do this by contacting the sponsor of the good to arrange supply; however, the sponsor is not legally obligated to supply the good. You can also ask a pharmacy or supplier to arrange supply of the unapproved good. 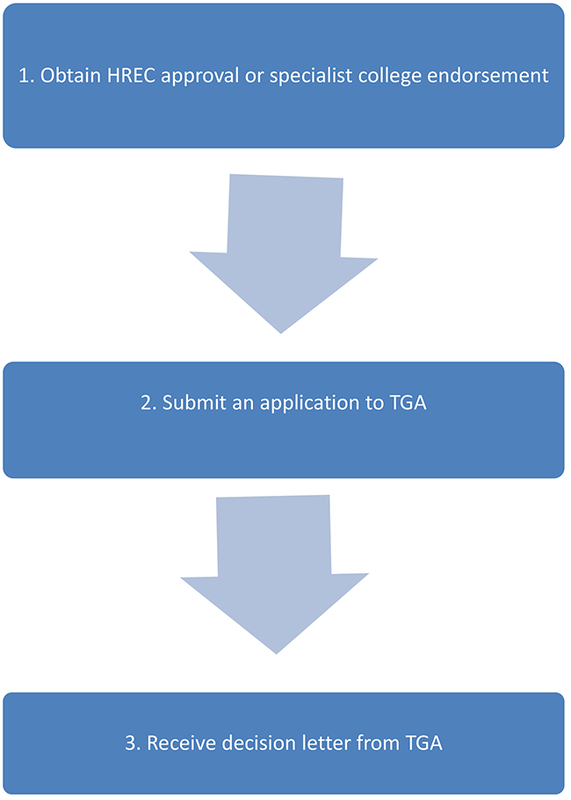 You must give the sponsor a copy of your TGA approval letter. This authorises them to legally supply the good for use. You must also consider whether the good is controlled under the Customs (Prohibited Import) Regulations 1956 and the Customs (Prohibited Export) Regulations 1958, and, if the good is controlled, obtain a permit to import it from the Office of Drug Control. Access to medicinal cannabis may have additional requirements. For further information, refer to the TGA web page discussing Access to medicinal cannabis products: steps to using access scheme. If you are supplying the goods in a hospital, you might need any hospital drugs and therapeutics committees to approve the use and funding of these goods within the institution. Unapproved therapeutic goods are not subsidised under the Pharmaceutical Benefits Scheme (PBS), so you should consider the cost that will be incurred. In prescribing the unapproved good for a patient, you are responsible for considering the benefits and risks that apply for the patient. As unapproved goods have not been evaluated by the TGA, you should remain informed of changes to the benefits and risks as they arise. Prescribe the goods in accordance with the legislative requirements relevant to your State or Territory. You will receive a periodic report template with the letter of approval. You must report to us every six months (for the periods ending 30 June and 31 December) how many patients you treated with the unapproved good during that six-month period. You must send this to us within one month after the reporting period. If you treated no patients during that time, you must also report this. Unapproved therapeutic goods generally have not been evaluated for safety, quality and efficacy and could pose unknown risks. When you become an Authorised Prescriber you must report any adverse event or product defect related to the unapproved good to us within 15 calendar days of learning of it. The HREC, specialist college and/or the good's sponsor may also require you to provide them with adverse event reports. There are various ways to report adverse events and product defects, which can be found on our website at Reporting adverse events. If a suitable alternative good becomes available on the ARTG, you should stop using the unapproved good. If there is a good reason to continue using the unapproved good you must reapply. You will need to submit a clinical justification to your evaluating HREC or specialist college on why you want to use the unapproved good instead of the now approved good. The HREC or specialist college will consider this and decide whether continued approval or endorsement is appropriate in light of any available approved good that has been thoroughly evaluated for safety, quality and efficacy. You must then resubmit this approval or endorsement to the TGA in a new application to become an Authorised prescriber.